"Ship to ship transfer operations off Hong Kong and mainland China". 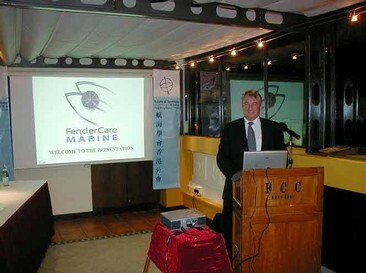 Speaker : Captain Eric Southworth, Director, FenderCare. 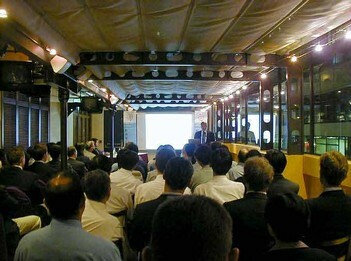 Marine Ltd.
On the 16th September 2004, the Hong Kong branch held a presentation on the subject of ‘Ship-to ship transfer operations’ at the Foreign Correspondents Club in the heart of Central. 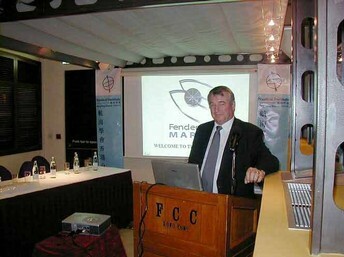 Chairman Harry Hirst introduced Captain Eric Southworth, Director, Fender Care Marine (Asia Pacific) to an audience in excess of fifty members and guests. Captain Southworth joined Fender Care as a Mooring Master after a career at sea rising to Master with Shell, and pilotage. 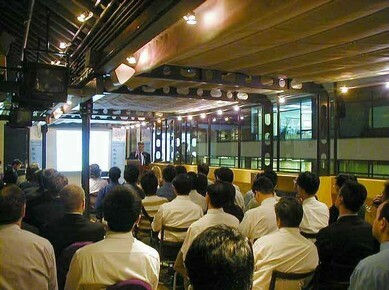 He spends his time based both in the company’s Norwich headquarters and in Singapore. His company’s Mooring Masters are trained on simulators and then given on-the-job experience, supervised by Senior Mooring Masters. Most are ex-tanker Masters and Pilots. Captain Southworth first emphasized the excellent safety record of ship to ship transfers. His company has been involved in over 6,000 routine operations, with no incident having taken place. Currently between 80 and 150 STS operations are carried out each month in the U.S. Gulf – again with no reported incidents. Provided the OCIMF guidelines are followed, there is no reason why STS operations for a tanker should not be as safe as cargo operations carried out alongside. Discharging alongside at terminals can often involve ships having to pass along narrow river or inshore channels, each of which involves increased risk of grounding and collision. The OCIMF guidelines are being rewritten, and the new (4th) edition should be available from ICS in October 2004. STS operations are required for various reasons. Sometimes an old ship will not be permitted entry to a port; sometimes the large size of a ship cannot be accommodated alongside; and sometimes a large tanker is required to supplement a port’s storage capacity. To be judged suitable for STS operations by the oil majors, certain recommendations should be satisfied. Fairleads used during STS transfer operations should be of the enclosed type, so that they will remain effective for controlling mooring line leads as the freeboard difference between the two ships changes. Tankers should be fitted with mooring bitts of sufficient strength behind each enclosed fairlead and its attendant winch. Provision should be made for securing fender lines. The ships’ cranes/derricks must be in satisfactory condition and of suitable SWL to handle the cargo hose and fenders. Steel wire mooring lines must be provided with nylon pendants at least ten metres long. Long handled fireman’s axes should be available at all mooring stations. Good control of the ship will be required at slow maneuvering speeds. The side for mooring must be clear of all over-side obstructions, permanent or otherwise. Hose supports at the ship’s side must be adequate to prevent damage to hoses through chafing. The customer signs an agreement with the mooring company, accepting the majority of liability, as Fender Care has limited liability. Where an STS transfer operation is to take place within the territorial waters of a country, local regulations must be checked as local approval may be required. Before the operation starts it is necessary to determine the size and number of manifolds to be used, then to calculate the length of hose line required, based on the minimum and maximum freeboards of each vessel. It may be necessary for the Mooring Master to transfer to the other ship to explain the operation in more detail or to assist in securing the moorings and hose line. Normally one Mooring Master is employed, but on a difficult operation or one expected to last more than two days or so, two Mooring Masters may be used. The larger ship is steered on a steady course at slow speed (usually five or six knots), and the smaller ship is brought alongside with her port side to the starboard side of the constant heading ship. Normally the manoeuvre is done with the wind and sea ahead, but local conditions may dictate an alternative heading. At least ten miles of sea room is required as the operation normally takes about 1.5 hours to complete. The effects of ship interaction should be anticipated when manoeuvring at close quarters. The Masters of both ships must always be prepared to abort a berthing operation if necessary. The decision should be taken in ample time while the situation is still under control. Four fenders are employed along the parallel midbody. The end two fenders may be shifted as the change in draft results in a change of effective parallel body on the waterline. Care should be taken to avoid concentrating loads by passing several mooring ropes through the same fairlead, or on to the same mooring bitt. On completion of mooring, the constant heading ship powers all future manoeuvres. If a transfer at anchor is planned, it will proceed to the agreed anchor position and the other ship will have its engines stopped and rudder amidships. The constant heading ship should avoid the use of strong astern engine movements. After the two ships are secured alongside each other they are normally anchored for the actual transfer operation. However, if the water depth is suitable, both ships may drift or steam slowly during the transfer. Much will depend on the effect of the sea and swell on the fenders and the rolling movements induced in the participating ships, taking into account their relative freeboards. However, guidelines are that winds should be of not more than 25 knots, and the swell not more than 2/3 metres. If the wind increases to 30 knots then the transfer should be halted, and if the wind rises to 40 knots then the hose should be disconnected. 90% of operations off Singapore are carried out at anchor. In comparison, in Europe only 5% of operations take place with the ships anchored, and in the Middle East and off West Africa most transfers take place with both ships underway but drifting. In addition to the routine safety precautions taken during any oil cargo operation, action should be taken to eliminate the potential for incendive arcing between the two ships. The use of the ships’ main radio equipment can be dangerous. Radar operating in the 3cm waveband will normally be safe, but should be used with discretion. Each Master should take into account the estimated duration of operations to ensure that safe and fatigue-free watchkeeping can be maintained throughout. No helicopter operations are to be carried out during transfer of cargo and/or bunkers and/or ballasting into cargo tanks. Originally, Japanese ships used dead whales as large fenders. They were replaced after WW2, when the Japanese tyre manufacturer ‘Yokohama’ was asked to come up with a suitable man made alternative, hence the birth of “‘Yokohama” fenders. Before 1975 wheel type fenders were commonly used in positions 2 & 3, with “Yokohama “pneumatic fenders in positions 1 & 4. (All four positions are along the parallel midbody). Smaller secondary fenders may be used to protect the bow and stern plating from inadvertent contact during mooring and unmooring. Fenders may be secured on either ship, but it is preferable that fenders be secured to the manoeuvring ship. The official standard for fenders is ISO17357:2002. The standard pneumatic “Yokohama” fender (size 3300 x 6500mm) can absorb 183 tf/m energy at 60% deflection. A “Jumbo” fender (size 4500 x 9000mm) can absorb 478 tf/m. “Yokohama fenders” are constructed of 1” thick rubber. Berthing forces: when two VLCCs come together at an approach speed of 0.15 m/sec, the force experienced is 115 tf/m. With both ships underway, 50% of the energy is dissipated and the ships pivot about the fenders. If one ship was made fast alongside, the same approach speed would result in twice the force. Photographs were shown of a fender being pressure tested to destruction. First filled with water to reduce noise, the fender burst when it reached a pressure of 3.2kg/cm2. Fenders are fitted with relief valves that operate at 1.8kg/cm2. In normal operation, maximum pressures experienced are usually 0.5kg.cm2. Helix hoses are heavy and prone to kinking. Hoses can be either electrically continuous or isolated. In the 1960s Shell and Yokohama Rubber developed a helix free hose with antistatic properties. The wall consists of a nylon corded layer between two 10mm vulcanized rubber inner and protective outer layers. Instead of nylon, a canvas weave has been used but found to be not so good as nylon. The best brands of fender can last 30 years. Cheaper brands last only 5 years. New hoses can withstand a pressure of 80 bar. They deteriorate with age. A seven year old hose was tested and burst at a pressure of 60 bar. The normal operating pressure is 10 bar. Where STS operations have taken place at anchor, unmooring may be carried out with the constant heading ship remaining at anchor, but unberthing at anchor is not recommended for inexperienced Masters. Where operations have taken place underway, the combined two-ship system is normally brought head to wind before unmooring. Separation of the two ships is often more difficult than the original mooring through difficulties that may arise due to local conditions or vessel configurations. Unmooring may be achieved most simply by singling up fore and aft, then letting go the remaining forward line, and allowing the bow to swing away from the constant heading ship to a suitable angle, at which time the stern line is let go and the manoeuvring ship moves clear. A lively discussion forum followed, after which Harry Hirst thanked the speaker for an interesting presentation and thanked FenderCare for their sponsorship contribution for the event. Harry also thanked Unique Shipping and David Howarth for their cash donations to the Institute on the evening. 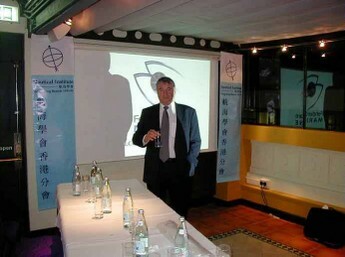 Interaction then continued as members and guests then continued to enjoy the refreshments laid on by the FCC.